We are located on the Mendocino Coast, between Mendocino village and Fort Bragg, about halfway between Russian Gulch State Park and Caspar Beach, on Point Cabrillo Drive. 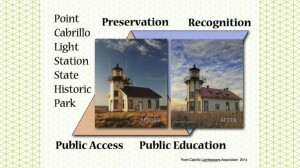 Parking: The Light Station is approximately one half mile walk from the entry gate on Point Cabrillo Drive. Please park vehicles in the paved parking area at the gate. The parking area is open from sunrise to sunset daily. Handicapped access parking is available at the Light Station in front of the residences. After you arrive, it is time to explore.